Visit the Donut Galleria In Real Life! Terror and excitement—two feelings I need before saying yes to an overwhelming idea. I said yes, and I feel those things today. So, what’s happening? Saturday, October 5th is the Donut Galleria’s first real-life event! Holy cow!! If you’re wondering why things are especially quiet on the blog, that’s why. I’m ramping my shop effort from 0 to Actual Business in only a couple months. Woah nelly! I’ll have original donut watercolors, prints, and (fingers crossed) some notebooks, cards, and a pre-order of a Donuts of the Bay Area calendar I’ve been working on so very, very hard. Please come and say hello, do some shopping, and show support for myself and the other seriously awesome makers. That sure as heck sounds like a good time to me! I recommend you clear your Saturday afternoon and round up your favorite girl posse for a field trip. 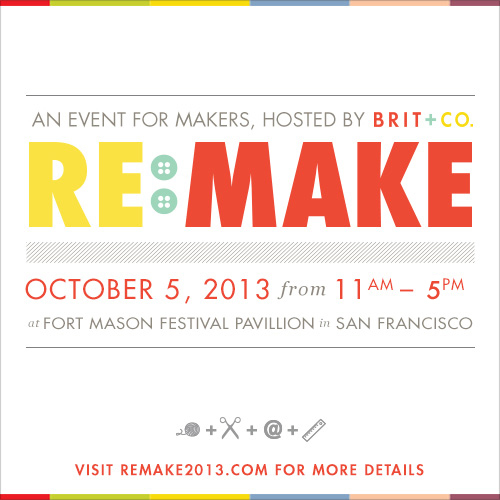 If you’re the type that forgets, RSVP to Re:Make 2013 on Facebook. If you’re curious about the other things happening at Re:Make, learn a heckuvalot more on the Re:Make website. You can also browse the overwhelming and inspiring list of other makers who will be there. Now if you’ll excuse me, there’s more work to be done. Psst: I’m sharing my progress/process on Instagram, so come get a sneak peek! Posted in Crafts, San Francisco and tagged booth babe, Brit+Co, craft fair, donuts, event, ReMake2013, watercolor.